As a born and raised Aucklander, the Gallery was a recurring presence in my childhood. My earliest memory of it is only half-formed: flickering images of intimidating carved wooden figures. 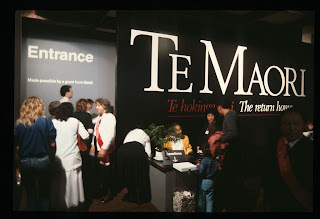 A quick talk to my mum confirmed we did indeed go to see the exhibition Te Maori Te Hokinga Mai: The Return Home – I was only four years old at the time but it clearly made an impression. The first exhibition I really interacted with, though, was Rembrandt to Renoir: 300 Years of European Masterpieces from the Fine Arts Museum of San Francisco, as a 10-year-old. It was a Sunday family outing and we dressed smartly for the occasion. I remember the paintings displayed against black walls and being taught by my parents how to view the impressionist paintings from a distance so they ‘made sense’. A visit to the Gallery was a common school trip (see also: MOTAT, the Museum, Kelly Tarlton’s). Most of my recollections, however, centre around the journey rather than the exhibitions: riding on a bus, lining up outside in the courtyard for what seemed to be an interminably long time and on at least one occasion spotting a dead pigeon in the fountain. Inside? I haven’t the foggiest idea what we saw but I know we had to be very quiet, and we were not allowed to run around or touch anything. This was a huge challenge for my hyperactive self. A quick flick through my parents’ bookshelf reveals the catalogue for Love and Death: Pictures from the Collection (1993-1994) so it’s highly likely I was carted along to that too, and I know I saw at least one of the McCahon retrospectives that were held in the 1990s. In sixth form I started studying art history and a visit to the Gallery was no longer something that was organised for me, but something I instigated. After a term studying pop art, I bowled on up to the Andy and Friends exhibition with my mother and a friend feeling extremely smug for already knowing so much about many of the artworks. How clever I thought I was to be able to appreciate pop art, while my poor bourgeois mum preferred ‘old-fashioned’ landscapes and portraits. We also popped over the road to the NEW Gallery to see Stories We Tell Ourselves: The Paintings of Richard Killeen, where we found more of a middle ground. Everything changed again when I turned up to university in my scruffy jeans and realised how much I really had to learn about art. Of course, I knew what I liked, but often my reasons for enjoying a painting were nothing to do with execution, technical excellence or profound subject matter. 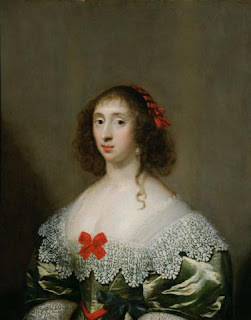 While other students gazed intently upon a Very Serious History Painting and scribbled down notes, I would be sniggering at artworks like Cornelius Johnson’s Portrait of a Lady. I challenge you to look at this woman without a titter. I love her gormless expression, the absurdity of her broad-shouldered attire and the odd composition that sees her sitting beneath a vast amount of empty space. Maybe I wasn’t the most academic of scholars, but I did learn the importance of having an emotional reaction to an artwork. After graduating I have to admit I forgot about my gallery. I did make it in to see Rita Angus: Life and Vision and the preview of Julian and Josie Robertson’s Promised Gift (which you can see in its entirety when we open on 3 September) but most of the time it fell into the ‘one of these days’ basket when planning my weekends. 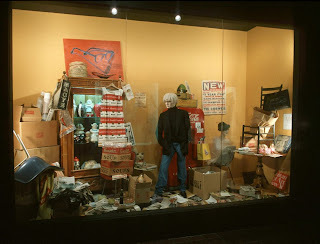 So there you have it – a potted history of my interactions with the Gallery. The thing that stands out when I look through the exhibitions history is how much I have missed. Like many Aucklanders, I’ve spent years professing my earnest intentions of visiting the Gallery more often and never quite got around to it. Countless exhibitions full of artists I now count amongst my favourites have passed me by and I regret this. I never really visited the Gallery when I was little - the first time I went there was through studying Visual Art in highschool. Having said that, I don't think I've been back since the first year of uni.. thanks for the reminder!